Norway is the perfect playground for anyone who loves the outdoors, with its snowy peaks, dramatic fjords, and scrub-covered islands. Norway is known for its wilderness culture, but is also modern with its advances in petroleum and hydroelectric energy. Norway is long and narrow, stretching about 1,100 miles north to south, but only about 60 miles east to west. Norway is located in the western and extreme northern areas of Scandinavia; it borders Finland, Sweden, and Russia. Its western coastline, approximately 13,000 miles long, borders the North Atlantic Ocean. Despite its size, Norway is home to only about four million people, half a million of whom live in the country's largest city, Oslo. Most of the four million of the country's inhabitants are located in Oslo and other southern areas due to the climate, which is less severe. Aside from Oslo, Bergen and Trondheim are the most populated areas of the country, with about 208,000 and 134,000 inhabitants respectively. About 70% of Norway comprises mountains, glaciers, and lakes. The country's Jotunheimen range boasts the distinction of having the highest mountain peaks in Europe north of the Alps. About 50,000 islands protect Norway from brutal storms along the western coast. 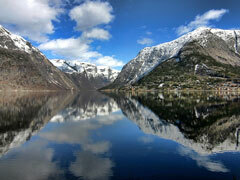 Norway is well-known for its majestic fjords, which draw a large number of visitors each year. These fjords were created thousands of years ago, when the ocean flowed into glacial valleys. One of Norway's most well-known and dramatic fjords is Sognefjord, which is extremely deep and spans more than 100 miles. The Glomma, Scandinavia's longest river, runs through southwestern Norway. But in general, Norway's rivers are short and turbulent, due to white water patches and waterfalls. For this reason they aren't compatible with transportation, but they do contribute greatly to the country's salmon industry. Because of Norway's location on the globe, it has interesting daylight patterns, and is often called "The Land of the Midnight Sun." Towns in northern Norway experience 24 hours of daylight in the summer, and 24 hours of darkness in the winter. In southern Norway, the day and night patterns are unique, with an average of 17 hours of daylight during the summer and 17 hours of darkness during the winter. We invite you to learn more about Norway's geography by spending some time studying the map of Norway shown below. Click on the map to display a higher resolution Norwegian map, showing Norway's Provinces, population centers, roads, and rivers. Map of Denmark - Denmark map and visitor info. Map of Sweden - Sweden map and visitor info. Visit Norway - official Norway travel guide. Norwegian Flag - images and history of Norway's flag.